Football managers will go to great lengths to get that little bit extra out of their players. And Doncaster Rovers boss Grant McCann is no different. The Northern Irishman revealed this week he has pinned up photographs of Championship and League One stadiums at the club’s Cantley Park training ground in an attempt to further motivate his men. 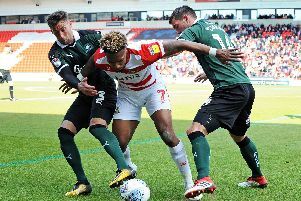 Rovers, who travel to Walsall tomorrow occupying seventh spot in the early standings, were among the bookmakers’ favourites for relegation before a ball was kicked. And McCann is also using those long promotion odds as another way of firing up his players. “It’s plastered all around the training ground, what the bookies tipped for us,” said McCann. “So the players know that. “There’s other things we’ve done too. “Given the choice of going to AFC Wimbledon or Derby County on Saturday - and that’s no disrespect to AFC Wimbledon – but there are pictures around our training ground of different League One stadiums and different Championship stadiums. “There are things we use as motivation. “There are things we want the players to grasp, and we want them to grab that opportunity. Rovers head to the Bescot Stadium, where they have lost on their last three visits, having been beaten just once in the league so far this season, at Burton Albion. “I think we have changed people’s opinion on us in this league this year,” said McCann. “Before the season started a lot of people had us down for probably finishing just above the relegation zone. “People in the know, the media and the bookies seemed to think that is where we’d finish. “But now we’re changing people’s opinion on us, which is a good thing. Doncaster have lost their last seven meetings with Walsall. The Saddlers, who are two places and three points better off than Rovers, are one of five teams still unbeaten in League One.